How to set up the default startup directory for a task? In this post, I summarize some of the advanced configurations of Cmder. Open Cmder settings and go to Startup --> Tasks and choose a task (cmd::Cmder or Cmd::Cmder as Admin, etc.). Click Startup dir... on the bottom right of the page and choose the appropriate directory. Restart Cmder and you should be able to see that Cmder start up in the given directory. But, if you have set up startup directory this, cmder here feature will not any more: Cmder will always open the directory you have set up. 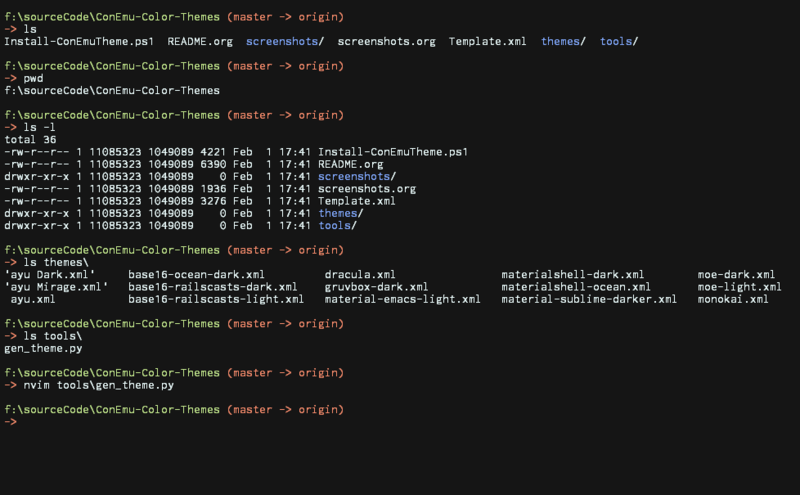 There is a project ConEmu-Color-Themes which provides a few color schemes for ConEmu, on which Cmder is based. Next, in order to avoid any errors, export your current Cmder settings to a custom directory. It will add the theme moe-dark to the theme list. Be careful with the space in path. If a path has space in it, you will encounter ParameterArgumentValidationError exception. The solution is to enclose the path with single quote. Finally, open Cmder setting and import the new setting file from the custom directory. 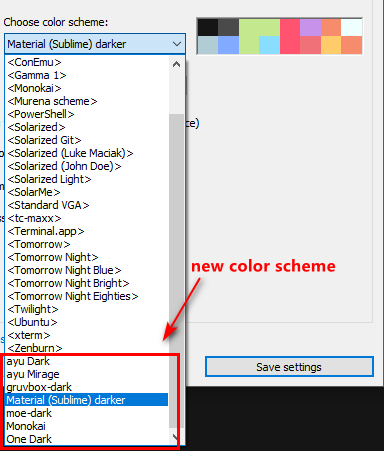 You should be able to see the new color schemes. Sometimes, we need to type a command over and over again. It is better to create a shorter alias for it. A great example is changing to directories on other drives on Windows. Due to histortical reasons, the cd command can only go to directories on the current drive by default. To go to directories on other drives, we need the /d parameters. Having to use cd /d each time is cumbersome. Restart Cmder and you should be able to cd to any directory you want! It is a small trick, but it works great and saves your time. Dealing with space in powershell script parameters. Enable the execetuion of powershell script. Microsoft official doc on Set-ExecutionPolicy. How to go to directory on another drive on Windows. Add custom alias in Cmder. Make alias which accept parameters.